Tips from a lawyer for writing a student appeal. Procedural Violations. 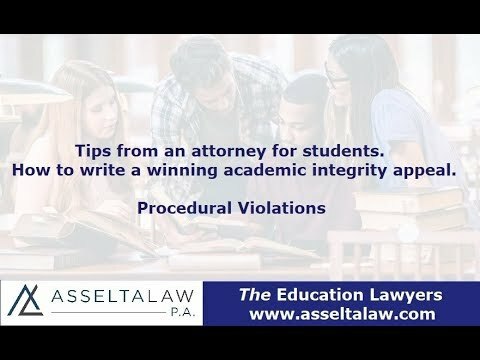 Tips from a lawyer for writing a winning student appeal. In this video, I would like to talk to you about student appeals. In particular, the appeal of discipline stemming from an academic violation. What is a student appeal? A student appeal is the final chance to overturn a sanction at college like suspension or expulsion. When can a student appeal a sanction? Let's say you were accused of some kind of academic or disciplinary action, you went to a conduct hearing and the committee found you responsible. Now you are facing a sanction. Typically, colleges allow students to appeal the sanction. A student appeal is time sensitive and often limited to just a few categories. The most important category to submit an appeal under is procedural violations. This category is the one that students have the best chance at winning. How do I know if there are procedural violations? In your student handbook there are procedures that your university must follow when a student is accused of academic dishonesty. If the university fails to follow those procedures, you may be able to win your appeal and get a new hearing. What do I argue under the procedural violation appeal category? Your arguments are written. This is important but can be very tricky. You must know how to spot the issues and frame your arguments to win. As an appellate attorney, I have acquired years of issue spotting. I wish I could give general advice but every situation is unique. Richard Asselta is an award-winning student defense lawyer who offers college student defense advising services throughout the United States. He is experienced in defending all types of college disciplinary issues. Click here to read what clients are saying about Richard Asselta on AVVO, a lawyer review website.